The trail begins with a staircase at the end of a cul-de-sac right in the middle of two different private properties. You start out in the shade of trees but soon emerge onto an exposed ridge of grass and shrubs, much like the front side. Also like the main trail, there are steep sections and side trails breaking off the main path, but overall this route is easy to follow. It wasn’t quite as eroded, but after heavy rain in the days prior it was a bit slick. It was only .4 miles and under 600 feet of elevation to reach our desired destination — Ka’iwa Peak, the highest point of the ridge. There is a pillbox here, but it’s not one of the main 2 that people usually hike to see. We only saw 4 other people this entire hike, which is much less than we’ve ever seen on the main trail. We hung out at the pillbox for a while enjoying the changing colors of the sunset. Curtis caught Pokemon, Charlotte sniffed everything. When we were ready to continue, we started heading on a new trail heading South towards a low ridge. 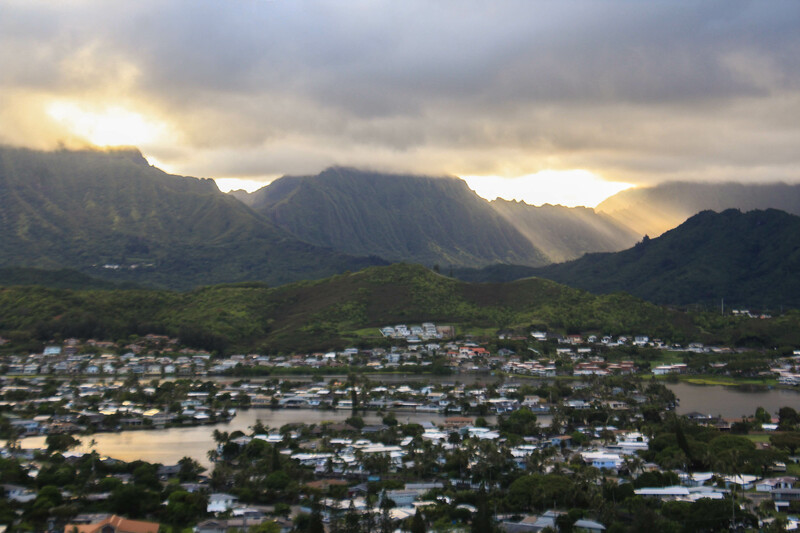 We came to some great vistas that provided views of the Ko’olau’s as well as our neighbor island Molokai. But once the trail dropped a bit more in elevation, things became more difficult. The trail became extremely overgrown, with grass taller than I am. The wide dirt path disappeared and became very narrow and muddy. After losing quite a bit of elevation, Curtis checked his phone and noticed that we had missed a turn that should have taken us off the ridge and into a neighborhood. We turned around in search of the hidden path. Unfortunately, Curtis’ phone was also nearly dead, and I had left mine at home. It was quickly growing dark, and we realized how unprepared we were for this situation. After a little more searching for another trail, we decided to return to the pillbox on Ka’iwa Peak and return the way we came. Things could have ended poorly, but thanks to the city lights and pale moonlight we were able to make out the path. The hardest part was losing depth perception in the dark, as the trail was rocky and uneven. At first I was stressed about the situation, but as I kept walking I thought about why I felt that way, and realized that if I were to just take it slow, walking in the dark could be very relaxing and enjoyable. Especially because there aren’t mountain lions hiding in the bushes. While I may enjoy walking slow, Charlotte was having no trouble finding her way and was always ahead of us. Curtis eventually passed me to catch up with her and made it to the car, and then returned with flashlights that he had stored in there. 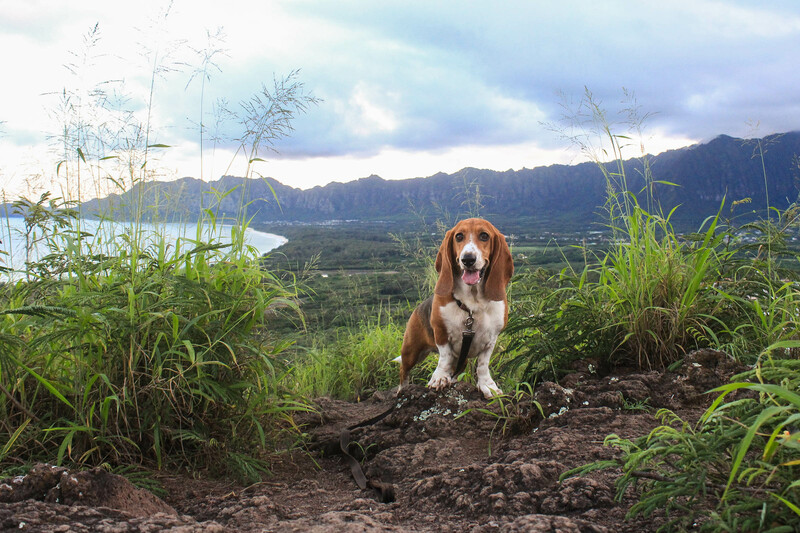 We won’t leave those behind on sunset hikes anymore, that’s for sure! We will definitely be returning to hike the back trails to Ka’iwa Peak in the future — I’m sure we’ll still occasionally take the main trail, but it’s nice to be familiar with the other option now. However, we will most likely stick to the trail on Kamahele Street and not the other overgrown one that we couldn’t figure out! Overall, our hike was just over a mile. 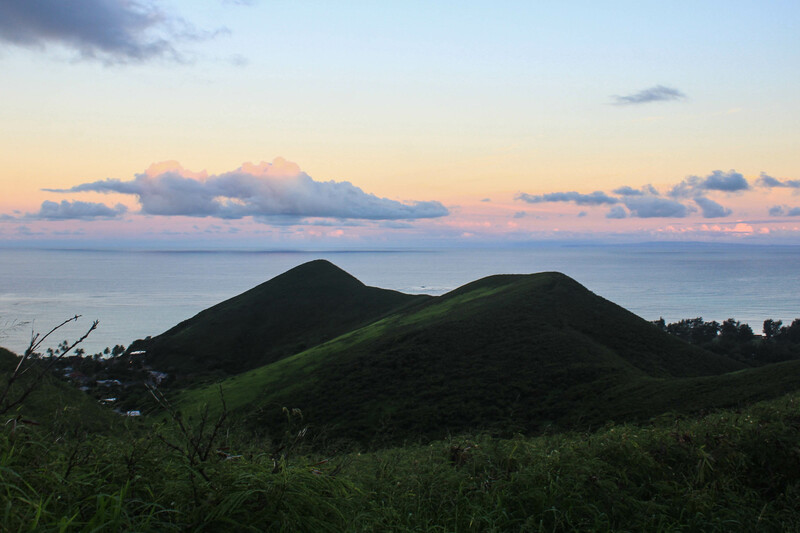 If you are considering whether to hike the main trail or the back trails to Ka’iwa Ridge, here are a few considerations: If you’re hiking to see the sunrise, I would say definitely take the main trail. 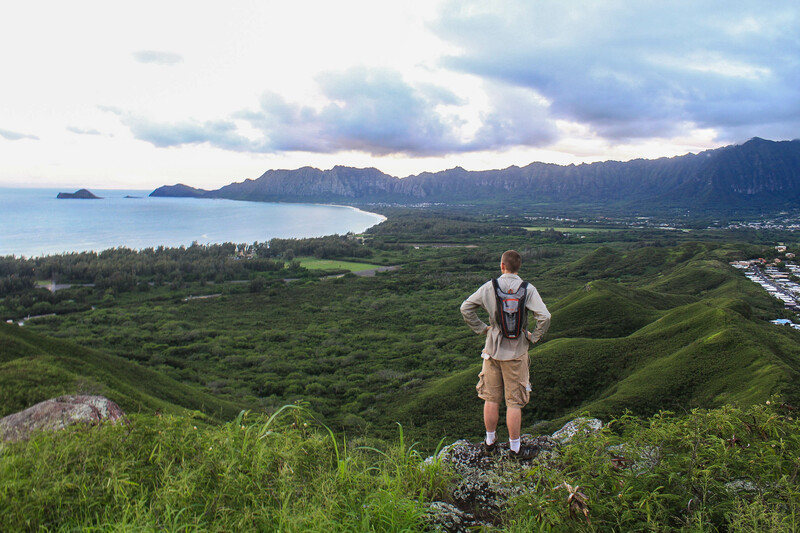 You will have an unobstructed view of the ocean and Mokulua Islands for the majority of the trail and will have a better view of the rising sun. If you’re looking for the more picturesque pillboxes, the first 2 on the main trail are what you want. If you’re planning on spending time at either Lanikai or Kailua Beach, it’s more convenient to take the main trail. However, if you want to take the path less traveled and eroded, the back trails up to Ka’iwa Peak are definitely the way to go. 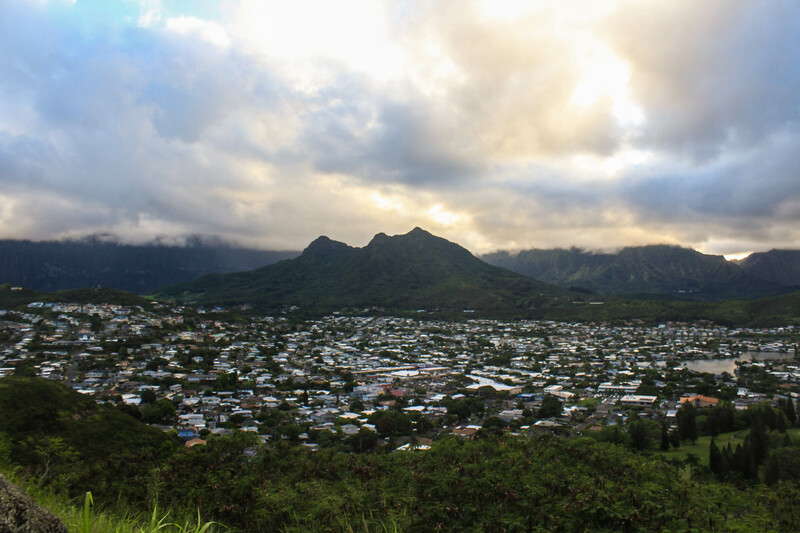 There are trails that connect between all of these points, so you can still hike to the other pillboxes with views of Lanikai. You could also plan a through-hike of the ridge, starting at one end and hiking to the other if you can work out the logistics.